Sometimes I see something creative and inspiring and I have to talk to the person who made it, wore it, put it out there for us. 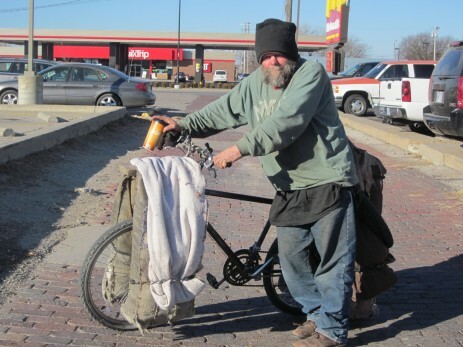 And people are so kind about sharing why…how….. Like Gary, when he told me about his beautiful handmade bike bags. This is Gary smiling in front of the Delano McDonald’s, where the 21st c. cowboys hang out. And I think I have sometimes called Gary homeless, just to identify, but Gary isn’t homeless at all. Because Gary knows more than anyone that this land was made for you and me and he. Gary’s outlook on life seemed like a great way to start Monday morning. And, since the days are getting shorter, you might see him. 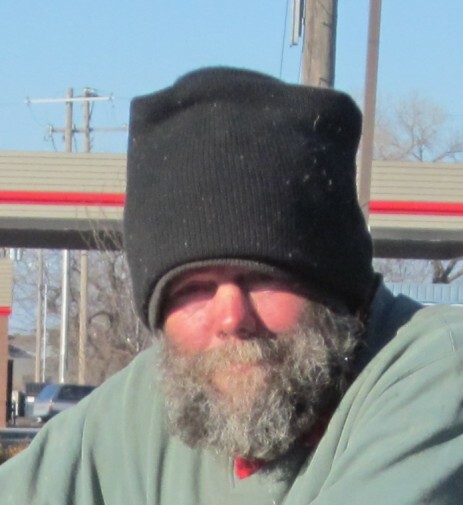 He’ll be heading from Jackson Hole back down south and maybe hangin’ for a while in Wichita. So, I wanted to alert you to look for him. And, given all the negative stuff we see about our country sometimes, I feel his outlook is refreshing. Gary takes the things I complicate, and makes me realize how complicated we can make our lives. Love Muffintop. 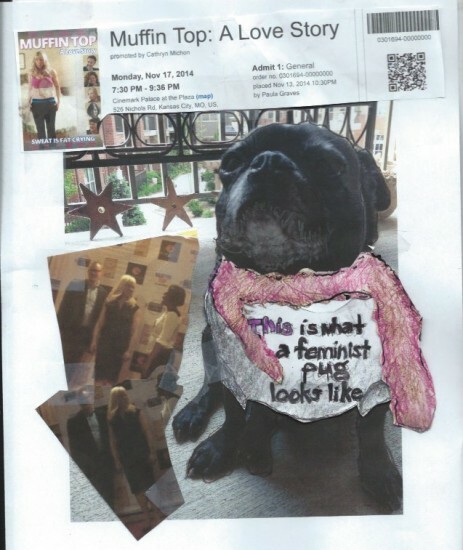 This is what a Feminist Looks Like. Catherine, Catherine! What a wonderful evening at The Cinemark. I had to just take this upon myself, as Paula has been cyber-ly overwhelmed. gave me pause…(paws? )…that is, what to wear. so I chose the Red Boa. And, I’m so pleased with the t.
Not what we wear, it’s how we participate. And personally, I like a little diversity, new blood. and her team of Tucker and Bruce. And soon, of Tom (Rooker) with your next flick filmed in ‘his home town’ Kansas City. Now, what can we do to make this a great city in which to film a movie? I can tell you that we MUST have better lighting. We will roll out the Red Carpet and put down a Star, for you have earned yours. I was running in Wichita Saturday morning in downtown Delano, a small historic area just west of dowtown Wichita. 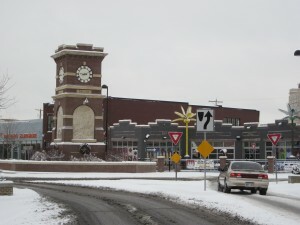 Delano has a wonderful clocktower, thriving businesses and is just across the river west of the downtown, a mile or so north of US hwy 54 (Kellogg) the east-west artery running directly through the city. In 1870, Delano became an important cattle-shipping center on the Chisholm Trail. With promises of $50 in eastern markets, cattleman drove cattle through Jesse Chisholm’s “cattle highway”, in this particular area, herding cattle across what is now the Douglas Street Bridge and south to pens on Kellogg. I’m partial to it because the cattle shipping industry became a crucial part of the formation of Delano as a recreational district for cowboys. Delano was the rough side of town as vices were kept out of the Wichita area. Most of the gambling, drinking and prostitution took place in the township of Delano, which did not have any law enforcement. Guns were checked at the bridge before you could cross into Wichita. People would shoot their guns and there were gunfights. I also heard later that it cost $5 to cross the bridge into Wichita which would have been quite the cover fee to hang out with the civilized folk when it was probably more fun west of the river. It’s still a fun place. I run from my daughter’s apartment at Friends University (see Friends University, New Year’s Eve 2010) north and east at 7:30 am when I’m in the city, so I was afoot when I met the first cowboy from Delano, a man without a mortgage. First a word about bikers. Wichita has more than it’s share of bikeriders downtown. All of the missions and kitchens are located in this area and for those living and surviving in the downtown area, it is the perfect size city for bike mode. When I worked downtown, I was so motivated and impressed by people I saw braving the vehicles that my kids and I rode our bikes from the ne suburban side of town 10 miles through the various historic neighborhoods, under the interstate, arriving downtown with our Old town destination. I notice bikeriders. Not the guys on the weekends in bikeshorts who bike for exercise and sport. While I did use the bikepaths near our apartment to get to the retail area on the weekends, it seems like we are building bikepaths in all the wrong parts of town. So, when I saw this man riding in the sub-freezing weather with his house on his wheels, I had to stop him to ask about his gear. He said his name was Gary, and he was kind to stop and tell me about his stuff. He shared his creativity, his plans for the day and spring, andI knew I wanted to hear more. And, he said I could take a picture. People are so kind about this. Not having my camera, I decided to run his direction to McDonald’s where he was heading for breakfast to hear more. Arriving at McDonald’s, he agreed to read the paper a bit inside after his breakfast waiting for me to run home and return with my camera to take pictures and talk more. Find the Men 4 Toys 4 Tots! They can Dance! 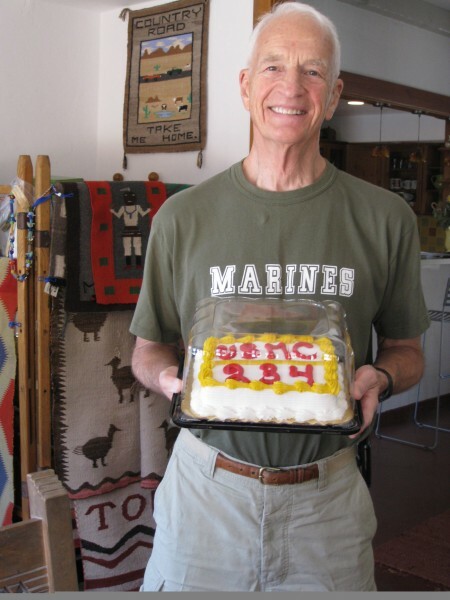 Dean Graves with U.S. Marine Corps Birthday Cake. Year confuses me, but I’m sure there is a reason. Thurs. Nov. 10th, 2011 was the 236th Birthday of the US Marine Corps. The U.S. Marine Corps is one year older than the United States of America. My father’s officer training class was #357. This class has had numerous reunions over the years because this class had four United States Generals. Everyone commissioned a second lieutenant has to go through Officer’s Basic School. This is my mother pinning a bar or something on my Father after his graduation from Officer’s Training School in Quantico. 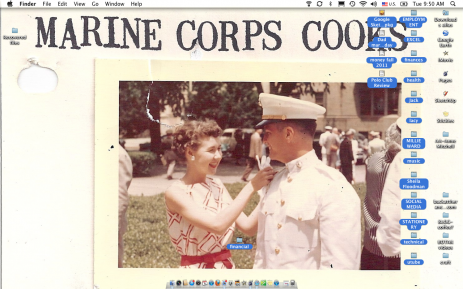 My mom felt that as a Marine Corps Wife (at that time) that she had plenty of time on her hands. She said, one of the things that they did was cook. She includes at least two delicious recipes that I remember in this section. They are for a concoction called “Pooh Punch” and for “Quantico Clam Dip.” She would have to tell you the story(ies) but I’m recollecting that the two in excessive amounts could be quite deadly to this group. She also noted that on the base, the competition among wives consisted of being the first one to get the laundry on the clothesline in the morning. And, the competition of who could get pregnant first. I don’t imagine that my mother won the first one, but I’m certain that she did the second; she has always been a high achiever. I do remember her saying that upon graduating from KU and after her marriage June 6th, her parents drove her to Virginia to move her in. I am not sure where my father was stationed or why her parents had this responsibility, but I am assuming it was as she said, the wedding with the USMC was held before hers. 3rd Basic School class for 1957. 600 (3 companies of 200), each company is 4 platoons, 45 in a platooon. Joe Hoar-4 star General, replaced Schwarzkopf (army officer) as Central Command (commanding officer for marines, air force and army for all forces on the eastern United States). All a chain of command thing. Chairman of the joint chiefs of staff rotates around between the three branches of service. The marine corps is part of the naval establishment, but has their own Commandant. 40 people in a platoon. my dad, Joe Hoar and Jim Joy are all in the same platoon. Hollis Davison is another 3 star general. Another 5th? That’s really the end of my notes from dad’s story by phone on the Eve of the USMC Birthday. The marines I met at the Candle Club in Wichita confirmed what he must have said, which is that after Officer’s Training he was then sent to Camp LeJeune, “Home of Expeditionary Forces in Readiness.” That is, he was assigned to a mission which he would lead and Camp LeJeune was the base where he was prepared for this duty. 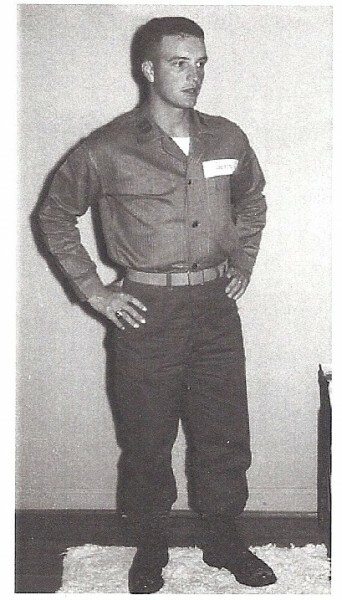 I was pretty little, but I do remember this outfit when my dad was in the Reserves. There is somewhere that I with him one time in Kansas City but I cannot remember why I would have gone. He would also be able to get us toys at the PA. He was no longer in Reserve Duty after his architectural practice began to require more time. And, I’m sure that is what any or at least many honest Marines say to themselves so often when they go to work each day and serve our Country when on a mission. But they go to work anyway, because they have taken it on as their duty to serve and protect our country. Honored to be in picture with Two Marines at the Candle Club in Wichita, Dec. 3, 2011. Another noble mission, Toys for Tots night. And they were in the line of danger with all the women that wanted to dance with them. And by the way, they hit the Aircraft Industry Events but by far cleaned up at my new club. The band was great and I didn’t dance, I took pictures. The Marine Corps also appears to have introduced a fabulous dance camp to their training regimen. Kudos.